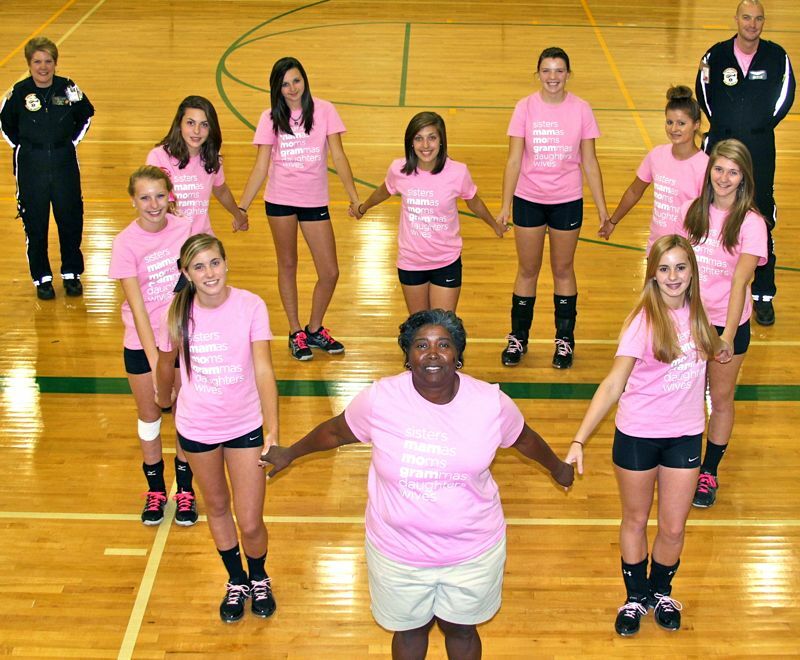 Photo By Mie Anderson : NCHS JV Volleyball Coach Toni Donigan (center front) joins hands with her team. October is Breast Cancer Awareness Month. The team is showing support for their coach who was diagnosed with breast cancer back in the spring of 2012. Petroleum Helicopters Inc (AirCare5) is supporting the cause by by distributing lapel pins, t-shifts and information cards. “I really like this group girls. I have been blessed by the Lord and coaching has helped me get through this season of my life,” that’s how Nelson County High’s Junior Varsity Volleyball Coach, Toni Donigan, sums up her last several months. Back in the spring of this year she found out that she had breast cancer. She underwent major surgery to remove the cancer. 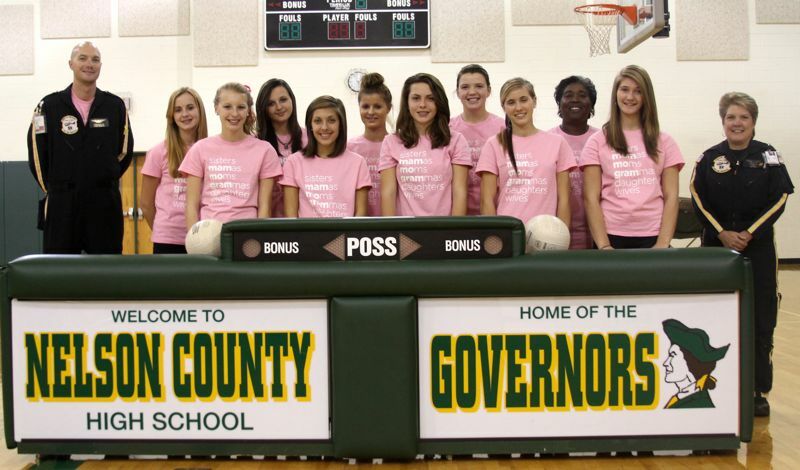 The girls volleyball team was very concerned for her Coach Donigan’s health. They weren’t sure she would able to physically return to coach their team for the season. To their surprise Coach Donigan not only returned, she didn’t miss a practice. “She’s like our mom,” one of the team members remarked. Coach Donigan and the team are flanked by flight crew members of PHI / AirCare5 based at Weyer's Cave, who support health initiatives each month such as Breast Cancer Awareness. Besty Smith (far right) a flight nurse and area manager with PHI has a sophomore daughter, Kaleigh, that plays on the JV volleyball team. Every October the girls JV and Varsity Volleyball team wear a variety of pink items to promote Breast Cancer awareness but this meant even more because Coach Donigan was personally affected. PHI AirCare 5 showed their support by donating pink Breast Cancer awareness t-shirts to the entire team and coaching staff. Tuesday the team wore the t-shirts to school, during their pre-game warm up session, and after the game to honor Coach Donigan. Sweet victory! 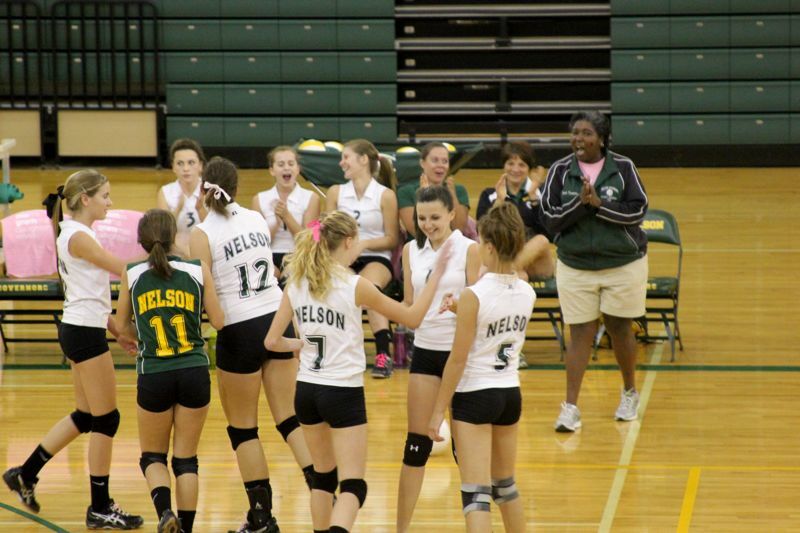 The Nelson JV Volleyball team also won earlier this week against Altavista, a team they lost to earlier in the season. That made the week honoring Coach Donigan even more memorable. Coach Donigan has one more surgery after the volleyball season ends. She’s been told she is cancer free! Way to go team and congrats to Coach Donigan on a good report! State Champions! Nelson Lady Govs Take State Volleyball Title : Congrats!